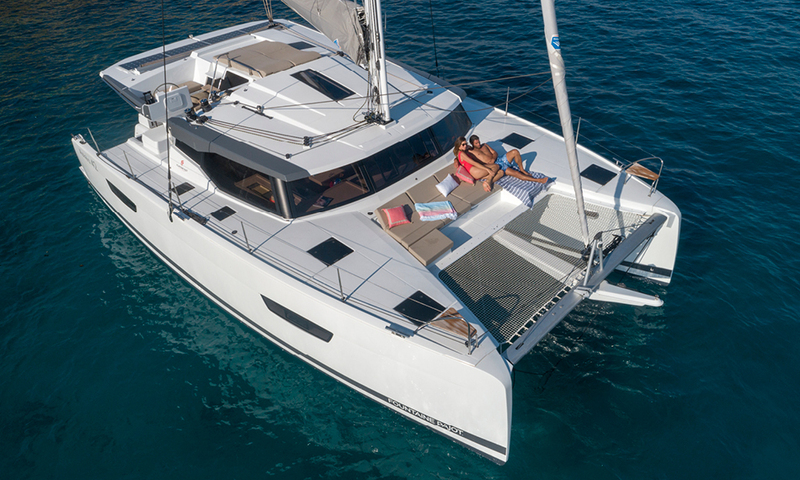 The new 2019 Fountaine Pajot Catamaran Astréa 42 has big boat features in a couples-friendly platform. Only a foot and a half longer than her little sister, the Lucia 40, the Astréa 42 incorporates some big boat features that set her apart from her competition. 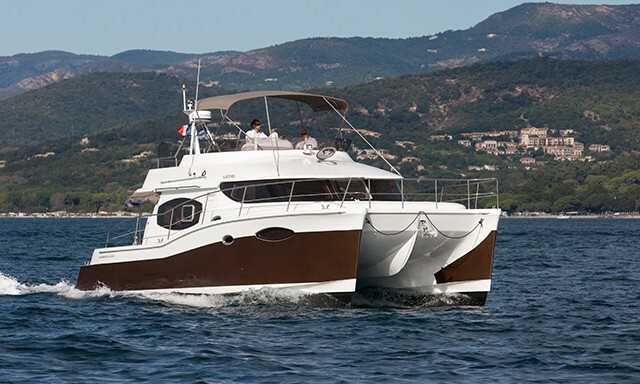 She borrows concepts from her larger sibling, the French builder’s award-winning Saona 47. From the open social areas to the easy traffic flow and generous amount of light inside, the new model feels larger than expected and has some lovely touches of luxury that make her a pleasure to explore. The Astréa 42 is a brand new design and not just a shortened or stretched version of a predecessor. The design team Berret-Racoupeau focused on creating comfort and ease-of-use for both charterers and private owners alike. 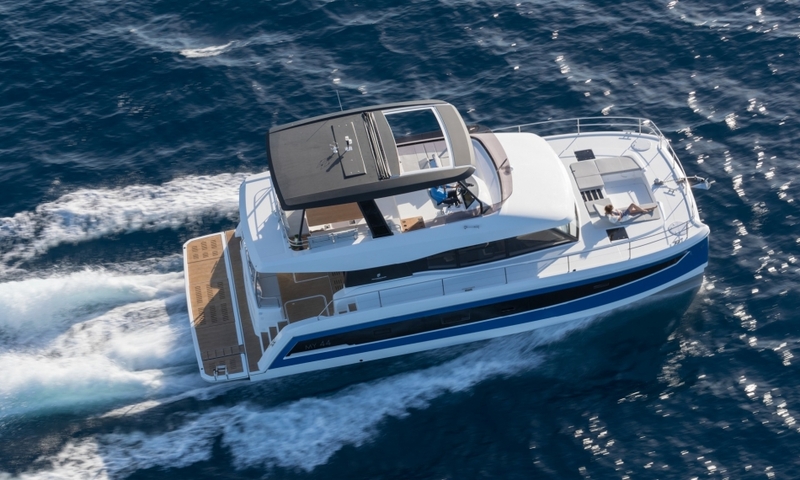 More versatile seating options, a voluminous interior with multiple layout configurations and larger windows make the boat friendlier and more useable. Aesthetically, the designers added slightly inverted bows to add the perception of speed or movement. Weight was kept low with a PVC foam core sandwich and vacuum laminated outer skin construction. The boat looks like a performance speedster bound for the racecourse but lives like distance cruiser with amenities that include an integrated plancha grill and plenty of lounge areas. The hydraulic swim platform is a fabulous feature that simply isn’t available on vessels in this class. This must-have option not only carries the tender, it also creates a teak beach that the whole family will enjoy. The Astréa 42 is a standout for its abundance of natural light, energetic lines, elegant living spaces and unparalleled comfort. The helm is elevated and to starboard. It’s molded into the hard Bimini that covers the cockpit. It’s an unusual setup where the wheel is aft, mounted onto a console that separates the wheel and seat from the three Lewmar winches and sheet stoppers on the coachroof just ahead. Although seemingly awkward at first glance, it does create separate working areas for both driver and crew ensuring neither will be squeezed when it’s time to tack or reef. 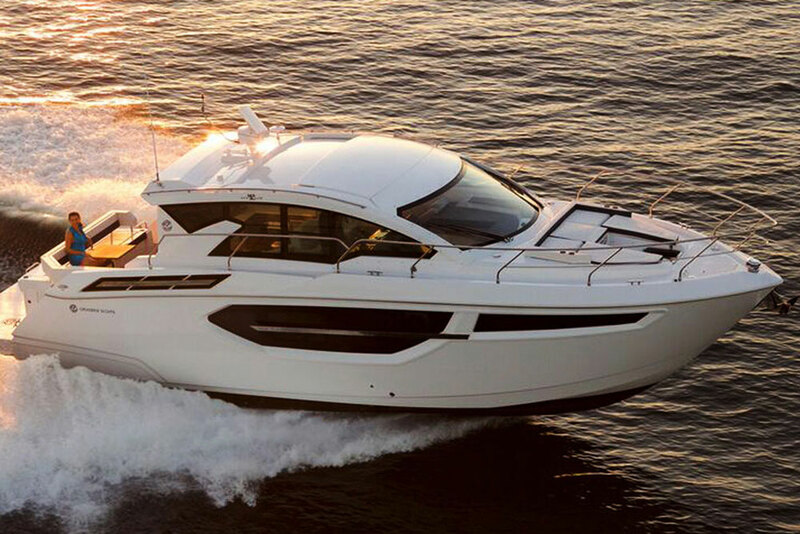 However, the boat can also be managed by one with the help of the autopilot. In that case, the driver stands between the console and the coachroof bulkhead and manages the lines while commanding the autopilot, which is within reach. An improvement on the presentation of the instruments includes an angled dash so it’s easy to see the Garmin multifunction display even while standing. The helm is accessed from the cockpit as well as from the side deck. It would be nice if the deck could be accessed directly so the driver had visibility aft to the starboard transom while docking. Because there is a fiberglass barrier between the seat and the deck, it’s currently necessary to walk around the entire console before setting foot on the deck. Also, you can see the mainsail above from the winches but not the wheel and that should be addressed. The space between the wheel and winches also serves as a landing that leads up to the coachroof. 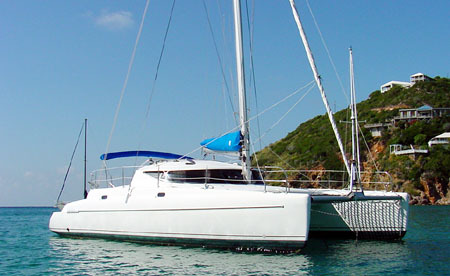 Here you can do two things – lounge on the centerline double sunpad or manage the mainsail in the bag. The boom was kept low so there’s no need to climb mast steps or up into the bag to straighten the sail or untangle reefing lines. 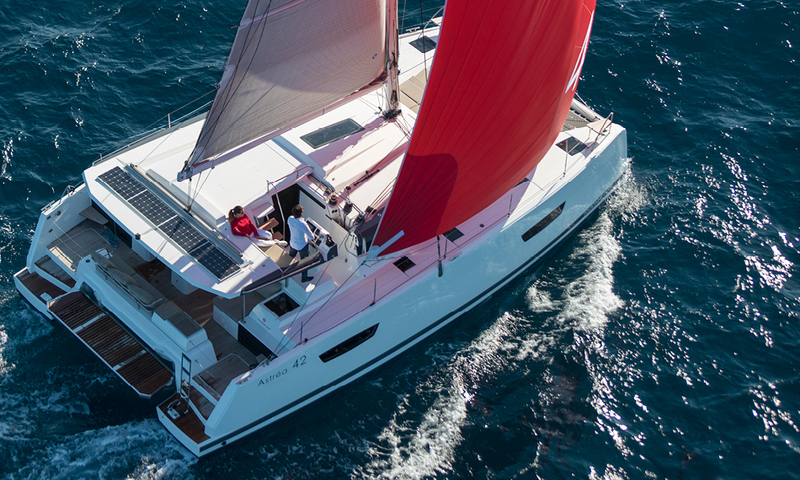 Fountaine Pajot developed a funky new mainsail halyard hook that automatically clips into the head of the sail as it’s raised and disconnects when the sail rests in the bag. Time will tell how this feature is accepted by sailors. The foredeck is the result of some good thinking. A U-shaped lounge with a foot well forms a dinette that will be perfect for happy hour on the hook when a boat in trade winds swings the aft cockpit toward the hot setting sun. For traditionalists, there’s still a small trampoline forward in which to lounge and the dinette cushions are cleverly split so you don’t need to remove them to access the lockers below. The aft cockpit flow works well even when there are many people aboard. To port is a dinette that will seat six comfortably and to starboard is a Vitrifrigo fridge and a double lounge. This leaves lots of open space for people to move about from the outside in and vice versa. The transom is functional and incorporates seating and the optional plancha grill. The galley and saloon was designed with expansive panoramic windows, allowing for plenty of natural light to shine in. Meanwhile, the U-shaped galley transitions with the cockpit using a sliding pocket door. We tested the fourth hull of the Astréa 42, which was outfitted with the Maestro (owner’s version) layout. Three cabins include the owner’s suite in the starboard hull with a walk-around island bed surrounded by plenty of light pouring in from windows aft and outboard as well as the hatch overhead. Amidships is an angled desk and forward is the head with an enormous vanity and sink and a nice walk-in shower that needs neither a door nor a curtain. The toilet is in a separate compartment. The port hull has two cabins and one head. 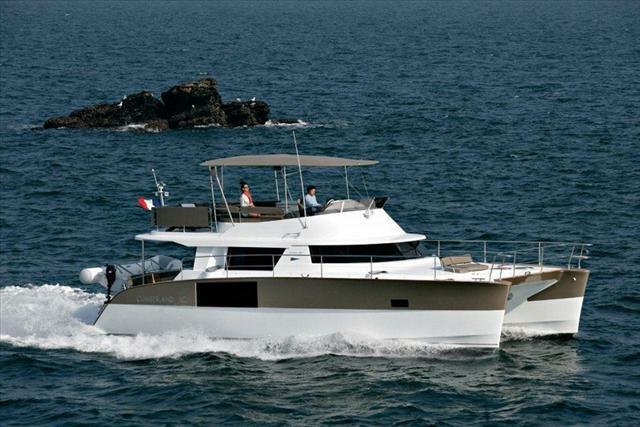 The Quatuor (four cabin) version will be the choice for large families and charter. 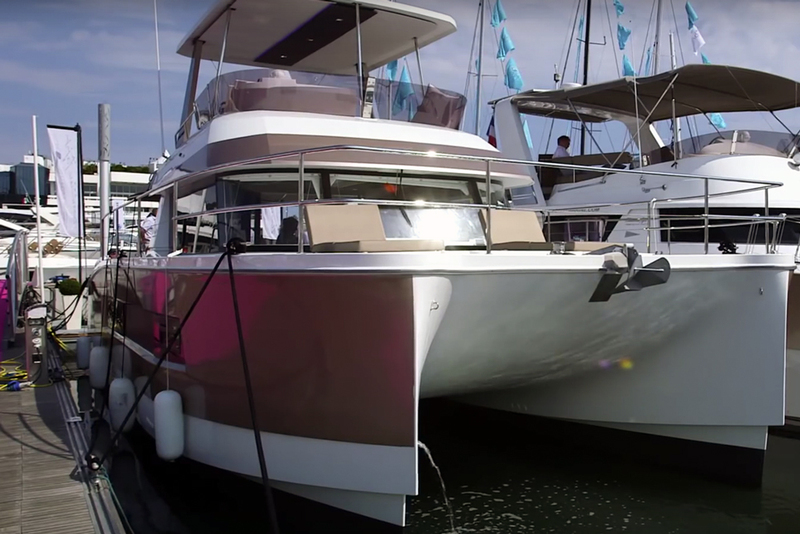 Fountaine Pajot mixes up the head configurations in the hulls with multiple cabins. You can have two completely separate wet heads, two heads with a shared shower compartment or the aft head can have its own full shower stall while the forward bath remains a wet head. For most, the two heads with shared a shower stall will make the most of the space aboard. The galley and saloon on the main deck work together seamlessly. Because the dinette is outside, the interior seating is designed as a lounge with a low coffee table and an angled navigation desk that shares the L-shaped seat. The galley is to port with a sink by the window and a three-burner Eno stove outboard along with an enormous countertop oven. Virtrifrigo refrigeration drawers are to starboard just ahead of the glass doors that connect the inside with the outside. Interior ventilation is comprised of two opening windows forward and a small hatch over the stove. 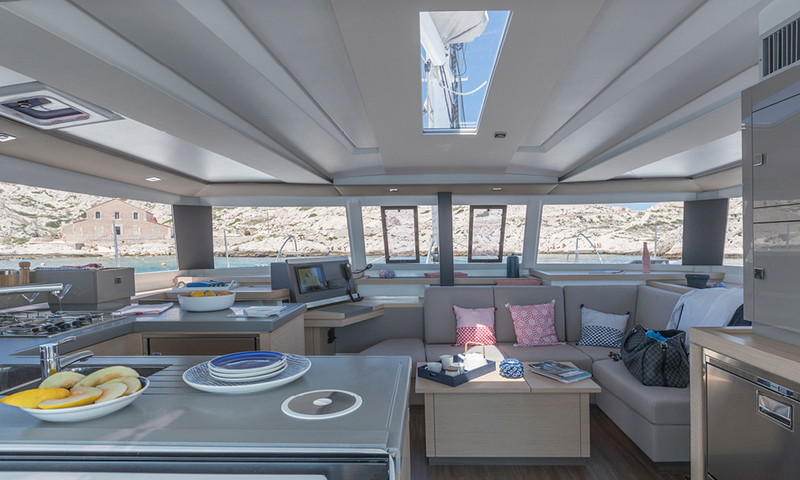 Fountaine Pajot’s trademark overhead skylight on the centerline brings in light but will also add heat as the sun’s rays hit it on the perpendicular. An opening version would make sense although there’s always the risk of leaks. This new model is available in two versions—Owner and Quatuor —with 12 bathroom layout options. Although the breeze on test day on the Chesapeake was woefully light, it was good to see a production cat that can point high and move in very light air. With just over 1,100 square feet of sail area between the genoa and the mainsail, the Incidence sails delivered 3.6 knots of boat speed in seven knots of breeze at 60 degrees wind angle. At 45 degrees off the wind, the speed went to 2.8 knots in six knots of breeze. The jib tracks on the cabintop are tight and far inboard which makes the headsail hook in and act like a brake. This can be remedied on most cats with a cheater line taken from the clew down to a midships cleat and opening up the slot. When motoring, the twin standard 30 HP Volvo Penta diesels delivered a cruising speed of 6.5 knots at 2400 rpm. At wide-open-throttle and 2900 rpm, we reached 7.5 knots. The cable (non-hydraulic) steering provides good direct feedback and the boat is agile with small fixed keels and a rudders drawing just over four feet. The Astréa 42 will be available in charter soon and using a boat for a full week in a variety of conditions is the best way to see if it will serve your needs. Although most charter versions are likely to forego the owner’s layout, you’ll be able to dial in shipboard living and sailing characteristics much better over a week than in just one afternoon. It’s likely the Astréa will surprise you in how well she handles and comfortably accommodates a full crew in only 42 feet. 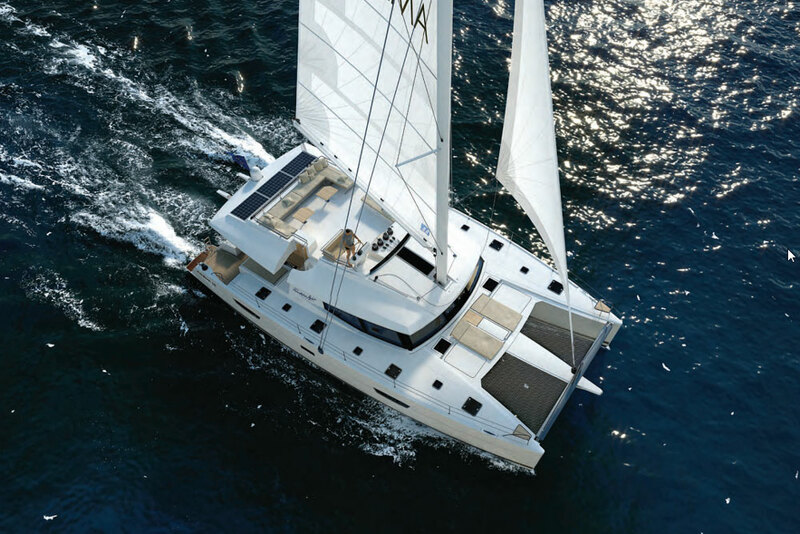 See Fountaine Pajot Astréa 42 listings, or learn more about other Sailing Catamarans on our explore page. Sail area 1,141 sq. ft.